Designed For Extreme Performance The ASUS Intel C621 ROG DOMINUS EXTREME Motherboard, a EEB motherboard thats compatible with ATX mounts, can support 6 channel DDR4 4200MHz+ (OC) includes dual DIMM.2 with heatsinks quad M.2, integrated Wi-Fi USB 3.1 and dual U.2. Every aspect of Dominus Extreme is designed to enhance your gaming and creative experience allowing you push the limits of your graphical output and work input. Designed to house the Intel Xeon W-3175X processor gain incredibly performance in various demanding creative work applications. Cooler by DesignROG Dominus Extreme is built to provide the best foundation for extreme scenarios. 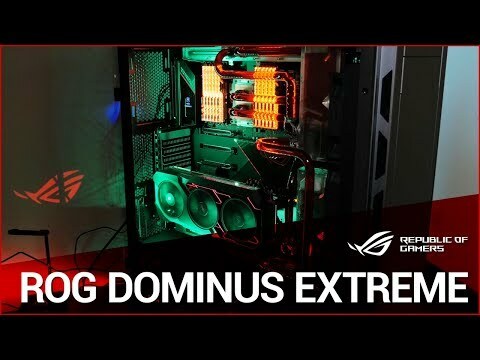 With 28-core processing, effective cooling is extremely important, so ROG Dominus Extreme provides comprehensive cooling features that enable higher performance at lower temperatures. Cooling and protecting Key components Multiple heatsinks and covers help protect components from overheating, the IO Cover is crafted from pure aluminuium to efficiently cool the 10G Ethernet controller, the dual backplates add rigidity and additional functionality to the oversized board. Fans located within the heatsink turn on above 30°C and allow ROG Dominus Extreme to handle sustained power draw of over 570 amps. The PCH heatsink blends seamlessly with the Aluminum cover. Underneath is a fan that turns on above 30°C and prominently features the ROG logo. 10Gbps Onboard ETHERNET ROG Dominus Extreme features Intel Wireless AC-9260 Wi-Fi (802.11ac) with 2x2 MU-MIMO and wide 160MHz channel, for wireless speeds of up to 1.73Gbps. In fact, the integrated adapter pushes wireless data up to 2X faster than other Wi-Fi solutions so you'll get fast, smooth transfers, even when your rig is further away from the router. Hear every small detail ROG is renowned for superior onboard audio, and ROG Dominus Extreme is no exception. The front-panel headphone output features a SABRE9018Q2C integrated DAC/amp capable of reaching -115dB to provide playback that conveys all the subtlety and nuances of the audio track. The improved resolution derived from the ESS Hyperstream DAC architecture expands the soundstage to give a better sense of positioning. Capable of 4200MHz+ DDR4 Memoryprocessors crunching multi-threaded compute workloads can demand colossal memory space and bandwidth. The Dominus Extreme features T-topology to maximize signal integrity and drive high-density memory configurations to speeds previously reserved for low-capacity setups. BRING YOUR WHOLE SYSTEM TOGETHERGear up with ROG components, from graphics and monitors to mice and keyboards, and up your game with complementary aesthetics, control and compatibility. The ROG ecosystem is more extensive than any competing brand, so enjoy greater choice as your system expands. GameFirst Networking GameFirst V is the ROG-exclusive tool that optimizes network traffic for faster, lag-free online gaming. Team your gateways, keeps tabs on bandwidth-hogging apps and make adjustments on the fly. RamCache Storage RAMCache turns milliseconds into microseconds to boost game-load times. Fully compatible with the latest NVM Express storage options, its uniquely intelligent technology effectively caches an entire storage device so that favorite games and apps launch at breakneck speeds. Sonic Studio Sonic Studio supports HRTF-based (head-related transfer function) virtual surround for VR headsets, casting an immersive aural landscape that draws you deeper into the action. The intuitive Sonic Studio interface also offers a range of EQ options and one-click presets, allowing you to tailor acoustics to suit personal preferences or the characteristics of your headset. Livedash OLED ROG Dominus Extreme motherboards is equipped with a 1.77” LiveDash — a built-in color OLED panel that displays useful information and customizable graphics. Armoury Crate The brand-new Armoury Crate portal keeps you updated with the latest drivers and BIOS releases. Its easy-to-use UI can be configured to show a variety of information, including security updates, bug patches, the latest ROG news, gaming events and special offers.